Qeridoo, Croozer and Thule Chariot! If you like to go on trips with the whole family, you have to think of the little ones as well. Whether it's a bike ride to the lake or just a short trip to the next ice cream parlour - children want to be everywhere. If the little ones do not yet have their own bike kids bike trailers are an optimal solution for all parents who like to be outdoors. These trailers can be attached to a parent's bicycle in a few easy steps and everything is ready for the family trip. 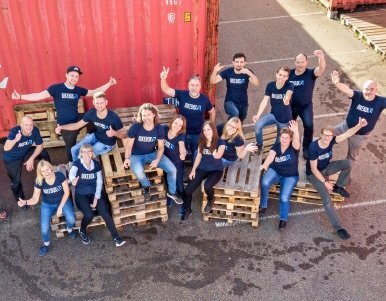 BIKEBOX – Safety is very important to us! Of course, the safety of child trailers plays an important role - a bicycle trailer must meet modern standards and offer the child maximum protection. With the use of a infant carrier or a baby seat, it is even possible to transport your infant from the first day of life. 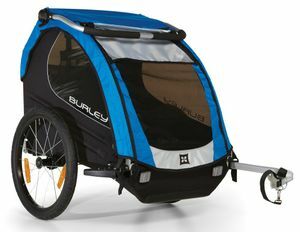 Among the bicycle trailers in our shop are brands like Burley, which offer the possibility to turn the model into a pram, a jogger or a sled. The Thule Chariot and Croozer brands are also known for their modern design and first-class quality. We recommend the top models Chariot Cougar and Burley Cub. Nevertheless, whether a simple bicycle trailer or a colourful children's trailer - whatever you like is permitted. Larger children who have active parents would naturally also like to have their own bicycle. After all, they want to be up close and personal on excursions and explore the surroundings themselves. As with a bicycle trailer, the same applies to children's bicycles - safety must come first. That's why the models not only look great, but also offer modern equipment including handlebar pads, rim brakes and much more. If you want to teach your child to ride a bicycle slowly, you should invest in a children's running bike. A wheel familiarizes the child with bicycles and at the same time has a lot of fun without feeling overwhelmed. And we also have the right vehicles for the younger children: Whether slides, tricycles or children's vehicles to help them learn to walk - you will definitely find them in our shop. If you want to take your child for pleasant walks, you also need a high-quality pram. Whether baby jogger, Phil & Teds or mountain buggy - the selection of prams is large. Thanks to the first-class quality, not only children but also parents are enthusiastic about the prams. Due to the large selection of baby joggers, even the active mommy doesn't miss out. With such a jogger you can experience the daily jogging route together with your child. And twin mothers and parents of several small children of different ages also get their money's worth with us: our range also includes a large selection of twin and sibling prams. Whether bicycle trailers, children's run bike, children's bicycles or transport trolleys - high-quality products are not always a bargain. If you still want to save a lot, you should decide to order online and benefit from our attractive payment conditions. Starting from an order value of 25 euros the order is delivered even free of shipping costs within germany. Of course it is also possible to buy products such as children's trailers, children's bikes and children's running bikes in our shop in Rottweil (Germany). Of course, our staff will be happy to advise you and work with you to find the trailer that fits your bicycle perfectly, the perfect pram or a child's bicycle that will make your child happy. No matter what you decide to do, whether you buy online or visit our store - in our shop you can expect first-class quality - in terms of products and advice.